Every (mammoth) requirements document would be an absolute joy to read. In our real-world projects, we deal with far too many of those “he said, she said” situations where malformed or vague requirements end up tanking our projects and tarnishing our business relationships. In the real world, sometimes the task of requirements documentation falls to a project manager or someone with limited technical proficiency and domain knowledge. And let’s not forget that documenting requirements is simply a tedious task—no one actually wants to spend their time creating (or reading) a 100-page print-out of an Excel spreadsheet. Put simply, requirements management is an intensive undertaking. 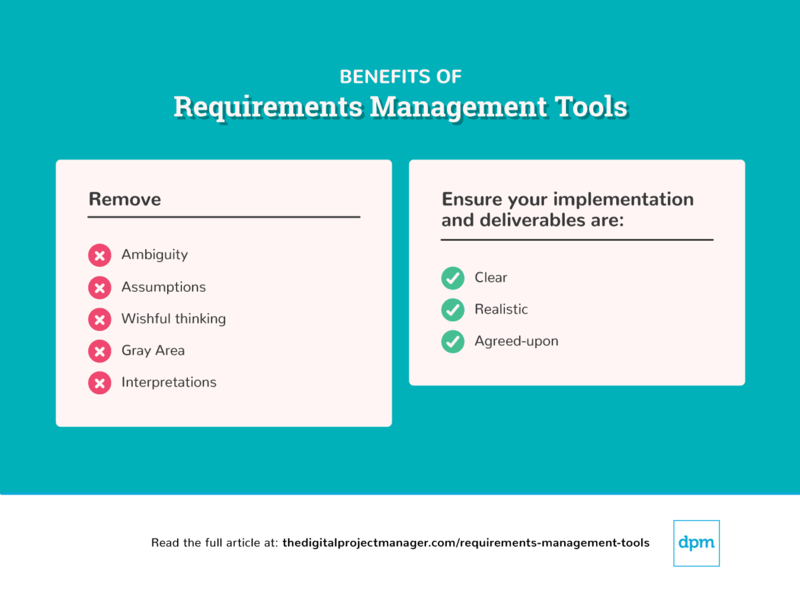 The good news is that there’s a wealth of tools out there to make requirements management simpler—easier to track, test, analyze, visualize, and communicate to stakeholders. In this requirements management tool review, I explain what these tools are, what they do, and how to choose the right software toolset for your use case. I’ve included a detailed breakdown of some of the top requirements tools on the market (including their features, main pros and cons, integrations, pricing, and and overall quality score) so you can decide which tool is the best fit for your organization. Requirements management tools (also called resource management tools or resource management software) are any tools that help you remove ambiguity—assumptions, wishful thinking, gray area, interpretations—from a project’s requirements. As such, the end goal of requirements management (RM) is to operate with clear, realistic, and agreed-upon requirements. You use these throughout the development process so you can easily test a product or project to ensure it does what it’s supposed to do. What Are Requirements Management Tools? The requirements management tools that you require will be different depending on your project methodology and goals. Likewise, your approach to requirements themselves will vary depending on methodology. For example, some teams use another word for requirements such as “user stories”, “product requirements”, or simply, “features”. For a very basic requirements management planning, you might simply use a spreadsheet or a word document template to fill in your requirements documentation. Excel or Google Sheets and a word document are your most basic requirements tools, and for some cases, they work just fine. However, they can become problematic. In this case, you rely heavily on individuals to update the documents, and it takes time and effort to ensure you’re working with the most recent version across teams. Managing feedback in a central place becomes a challenge as well. Often, you have to manage strings of emails and in-person feedback that must be inputted manually into your documentation. In more complex requirement management planning, your tool might be an entire software system for managing the relationships between requirements, analyzing the impact of any changes, managing approvals, and more. Jira is the most well-known tool in the market. Like most SW development tools, it offers some requirements management functionality, but Jira requirements management is not a one-size-fits-all solution. In this review, we look at some other tools specifically designed for requirements management that go beyond what’s offered in most software development tools. For more on the requirements management process, see our Complete Guide to Requirements Gathering. By and large, there’s a huge range of features offered in requirements management tools, including modules for product management, portfolio management, release management, customer management, and so much more. Here, I focus on the core functionality that any resource management software has to offer in order to serve its main purpose. Therefore, I’ve looked at tools that specifically help you gather, document, and manage requirements. This includes the ability to define requirements, model relationships between them, reuse requirements, and export/import requirements data for creating requirements documentation. This includes graphical tools and reports, interactive flows and simulations, dashboards, storyboards, and functionality for graphical models like UML or SysML models. In addition, a good resource management tool has to have some form of visual modelling. This helps users both gain a clearer understanding of processes and rules and communicate these to other stakeholders. Ultimately, being able to establish automatic relationships across requirements is key in requirements management. This is one of the major advantages of using resource management software over a simple spreadsheet. Traceable requirements and impact analysis include the ability to run test cases. In effect, this allows you to mitigate risks when requirements, people, decisions, and timelines inevitably shift during the course of a project. A good requirements software should include functionality for interaction between users. This includes the ability to review, approve, provide electronic signatures, gather input, and receive notification of other users’ activity within the software. The basic integrations you should look for are integrations with software development tools (SW development tools) word document, and spreadsheet tools. All tools should provide easy export/import of data to Excel as well as export of reports and software requirements documents to Word. Additionaly, many resource management tools come with a pre-built two-way sync with Jira. These are the top Resource Management tools that I included in this software review—find a summary chart and detailed description of each below. 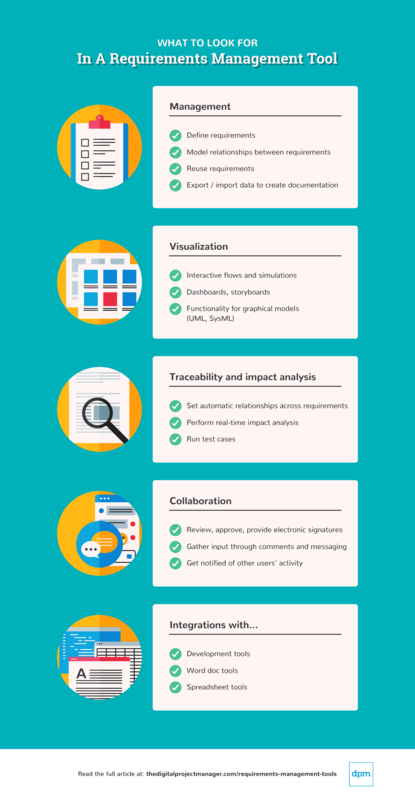 Here are a few of the best requirements management tools available today. Read on to understand what they offer, how they’re different from the other tools, and what types of organizations and projects they’re best suited for. Rational Doors is a big hitter in the requirements management software game, with a comprehensive group of resource management software and companion products. The main differential feature of Rational Door is its interoperability with other tools, including lifecycle management, team collaboration, and systems/software engineering (including MagicDraw, which makes it easy to convert spreadsheets into models that human brains can understand). As part of the IBM ecosystem, it integrates with Jazz-based products and hosted Jazz solutions as well. All in all, Rational Doors offers a flexible solution that works well for large-scale enterprises, offering a high degree of granularity and configurability. That said, Rational Doors’ greatest strength is also its biggest drawback—it’s highly customizable, but at the same time, its large database and general complexity can make configuration management a bit cumbersome. It’s not the easiest tool for everyone in your organization to use, although they do help you solve this potential issue by offering plenty of support: on-demand webinars, responsive support, how to’s, etc. Rational Doors costs from $164/month as a SaaS. Made by Micro Focus, Caliber (formerly Borland Caliber) is a requirements management tool with some great visual features for modeling requirements. In addition to traceable requirements and impact analysis tools, Caliber offers storyboards and simulations that allow you to test rules/processes to make sure they’re complete. The biggest advantage of Caliber is that it’s more visually interactive and intuitive than most other requirements tools, with drag-and-drop reordering of requirements and the ability to attach images and spreadsheets to requirements. Likewise, their collaboration features allow for easy user access control, collaboration, review and approval. It’s a nice stand-alone tool that’s easy to use, but if you want something that integrates with a bunch of other tools, there are better options out there, as it doesn’t come with pre-built integrations with other tools or systems. What is Jama? Really, this is a household name in requirements documentation and especially in software engineering requirements. The company offers a few different BA solutions, but their Jama Connect solution is where you’ll find useful requirements management features like live traceability and impact analysis. 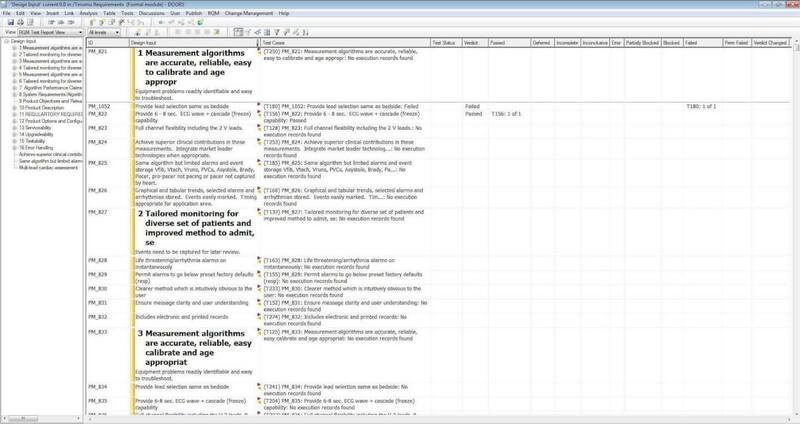 It offers the ability to create your own field level data, so if you’re looking for something highly customizable, Jama is a good choice. Something Jama does is especially well is their inclusion of test management features that supplies your QA team with dashboards, reports, and the ability to organize and run test cases. Users have also praised Jama’s collaboration feature called the Review Center, where users can monitor conversations, review work, gather feedback, get approvals, etc. The way Jama supports collaboration (approvals, notifications, etc) is seen as one of its strongest points. Just be aware that you’ll need a decent server in order to handle its memory requirements, as some users have found issues with loading. Jama integrates with many third-party tools, unlike some resource management software that lives within a closed-off ecosystem. Integrations include Jira, GitHub, VersionOne, Rally, TFS, MicroFocus, Perforce, No Magic, Enterprise Architect, and tracetronic. Pearls is an all-around useful and affordable resource management tool—it includes a wide variety of features like user role, backlog, and specifications management. After defining your use cases, actors, conditions, and flows, you can generate word documents (Use Case Document, Requirements Traceability Matrix, Requirements Specification Document) with a single click. Pearls also includes team collaboration features like comments and notifications of member activity, and if you need it, it includes a few project management features for defining project goals and managing stakeholders. Something especially great about Pearls is that their reasonable price and their flexible pricing, with a freemium “Starter” plan that lets you use it for free with 3 users or less. ReqSuite RM (from OSSENO Software) strikes a great balance between customizability and simplicity, providing enough features to be useful while remaining lightweight, easy to learn, and affordable. This requirements gathering tool includes a well-rounded toolkit of definable templates (along with the ability to create reusable requirements), workflow definition and visual modelling tools, and collaboration features. The biggest selling point of ReqSuite is in its ease of use—the navigation makes sense, it’s not overloaded with complexity, and the tutorials for using the product are genuinely useful. It doesn’t offer the capability of enterprise-grade system management that a solution like IBM Doors does, but it’s a great fit for most other use cases, and especially as a software requirements specification software. In terms of integrations, ReqSuite synchronizes bidirectionally with several other third party tools, including Jira, TFS, EnterpriseArchitect, and Excel—and their WebAPI lets you sync with additional systems. ReqSuite costs from about $194/month (€129/month). Accompa stands out among the crowd, not necessarily for its features but for its overall ease of use, ease of implementation, friendly pricing/payment model, and great customer service. That said, Accompa doesn’t have the most robust feature set out there. They add new features on a continuous basis, but if you need something comprehensive in the here and now, I’d look to big players like Jama or Rational Doors. In most cases, however, I wouldn’t be scared off by Accompa’s lack of features. This solution does offer a truly useful collection of essential features (or else they wouldn’t be on this list! ), and these include requirements traceability, automatic change and dependency tracking for impact analysis, discussion boards and alerts for collaboration, and requirements prioritization rules. It also offers some customization, such as custom fields, views, and user roles. Another advantage of this tool: an above-average set of pre-built integrations, including Jira, FogBugz, HP Quality Center, IBM Rational, IBM Rational ClearQuest, Bugzilla, trac, VersionOne, Rally, Agilefant, Seapine Software, SmartBear, and VisualStudio Team Foundation Server. Modern Requirements (formerly eDev Tech, also known as Modern Requirements4DevOps and MR4DevOps) is an innovative solution used across a variety of sectors including manufacturing, financial services, government, healthcare, and technology. This software offers an array of some of the most unique and cutting-edge features on the market. The strength of this software is that it can do essentially everything: requirements traceability, online document authoring, online review/approval, and visualization. Additionally, it offers process automation, test case simulation, planning boards, customizable dashboards, and even a AI-inspired business analysis assistant. It’s customizable enough to support any number of methodologies, and it can sync data with an array of ALM systems like Jira and Rational Doors through its Sync Bridge partnership. That said, it’s obviously a more robust solution that many organizations will require—it’s highly configurable, but it’s not the easiest solution to implement or learn to use. Modern Requirements costs from $1000/user for a perpetual license. Orcanos requirements management tool offers some better visualization and reporting features than others. This includes real-time dashboards that are intuitive to navigate, as well as their DocGen feature for importing/exporting Word files to easily create a software requirements doc, aided by custom templates and embedded reports. Orcanos delivers all of your essential requirements tools—end-to-end traceability, some basic collaboration features (messaging, alerts), and test management features. Additionally, users have praised Orcanos for their responsive customer support. Overall, this is an especially good tool if you’re eventually going to require a full QMS (Quality Management System) or ALM (Application Lifecycle Management)—with this tool, it’s simply a matter of upgrading your plan to gain access to ALM or QMS features for risk assessment, quality control, customer complaint management, etc. The only downside of this tool is its lack of pre-built integrations (it does integrate with Zapier, however). The pricing plan could also be friendlier—they do offer free 30-day trials, but their basic plan requires a minimum of 5 users (at $69/month each), so it’s not the best fit for smaller organizations. Perforce’s Helix RM software is offered as a stand-alone module in their ALM (Application Lifecycle Management) suite, a product widely used among top-tier organizations. This requirements management tool is scalable and can handle large files—it’s a great fit for large, distributed teams. Perforce has also gained a great reputation for responsive and effective customer support. Helix RM offers a full suite of useful features, including a better offering of graphical tools than your average resource management tool. 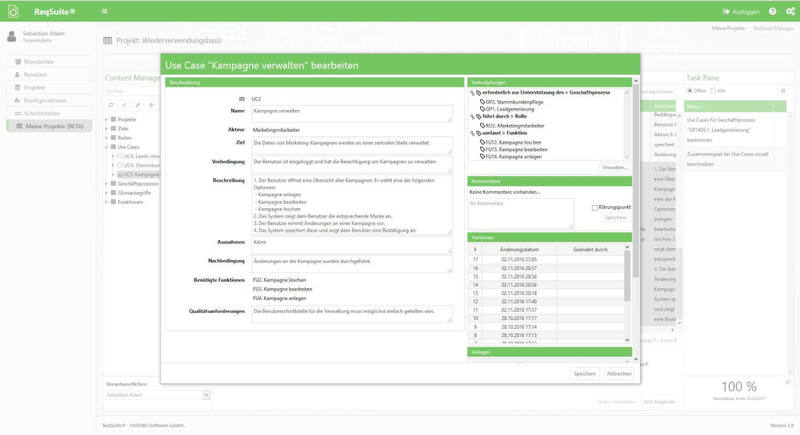 These include real-time collaboration features (comments, approval management, and easy file exports), impact analysis tools, requirements traceability and test case management, file history graphs and even a time-lapse tool to visualize an item’s progress over time. Helix resource management also stands out for its integrations—a two-way sync with Jira, as well as integrations with various Microsoft products, Slack, Eclipse, GitHub, Go2Group, Rational Doors, and OpsHub. Overall, Helix RM is a powerful tool, but it does take time to set up, implement and learn to use it effectively. The good news is that they offer a wide variety of resources like video tutorials, training, and a comprehensive knowledge base to simplify the learning curve. Perforce Helix RM costs from $179/month. If you’re looking for a tool that’s easy to implement, access, and learn to use, ReQtest should be at the top of your list. It’s a fully cloud-based tool that you can access from anywhere, with a friendly, transparent pricing model that intentionally accommodates small, agile, and scaling teams (as well as large organizations) with a “pay for what you use” approach. ReQtest offers a complete suite of useful requirements management tools as well as features designed for agile requirements gathering. These include test management tools, bug tracking and visual bug reporting tools, end-to-end requirements traceability, easy data export to Excel, collaboration features, and agile task boards. This is a lightweight but effective solution that works well if you’re happy with a stand-alone tool (ReQtest has a two-way sync with Jira, but no other pre-built integrations) and have no need for it to perform the functions of a full QMS or ALM system. Overall, it’s one of the most affordably-priced solutions out there. It starts at $10/user/month, making it low-risk introductory solution, especially for organizations who are using a requirements management tool for the first time. The chart below provides a basic summary of the top requirements management tools included in this review. Get a snapshot of each tool’s basic pricing info, trial info, and overall quality score, and then read a detailed review of each tool below. How To Pick The Best Tool For Your Team? All things considered, learning to use and implement a requirements management tool is an investment of time and energy. Before you dive in, you want to ensure that you’re choosing the ideal fit for your projects. I simplify the process by providing you with some of the most important questions I think you can ask during the selection process in order to narrow down the options. The more lightweight resource management software on this list includes ReQtest, Accompa, ReqSuite, and Pearls. The more robust resource management software on this list includes Rational Doors, Perforce Helix RM, Orcanos, and Jama Software. Middle of the road? Look to Modern Requirements and Caliber. Do you want to buy a license or access cloud-based software? Most requirements documentation software offers the selection between a cloud-based service and an on-premise installation. With this in mind, however, there are several completely cloud-based tools such as Accompa, ReQtest, and Orcanos. Consider your ability to host a solution on premise. As a result, you’ll be able narrow down the options significantly. How easy is it to implement and learn? Cloud-based or on-premise? See above. Right off the bat, a cloud-based Saas will be quicker to implement than an on-premise solution. Availability of training and support? 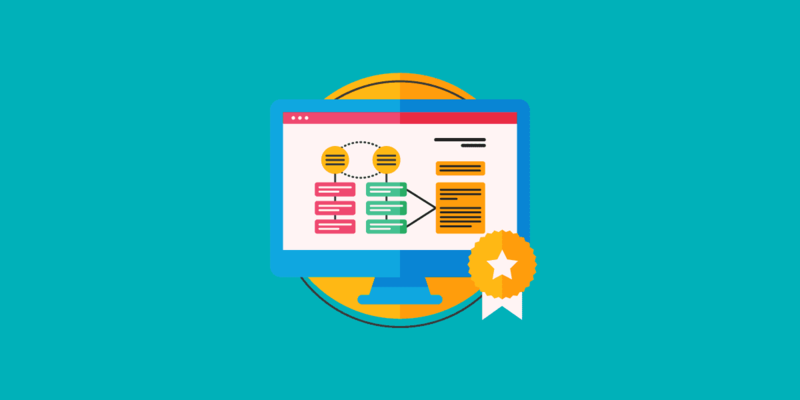 If you expect your team to require some training and ongoing support, look to requirements management tools that have received praise for their above-average training and support: Rational Doors, ReqSuite, Accompa, Orcanos, and Perforce Helix RM. Pre-built integrations? The tools with the largest number of pre-existing integrations (by far!) are Jama, Accompa, and Perforce Helix RM. If you’re looking to cut down on implementation with a tool that plays nicely with your existing development and business tools, those should be at the top of your list. Which requirements management tools have you used? What are the main points you think a resource management software solution should cover off? Share your insight with our community of digital leaders below.